At the risk of offending Python fans everywhere… I have to say, no Reg they dont’t. Roads are at the centre of everything we do. Our entire economy succeeds or fails on the quality or our roads network and although road building has moved on considerably since Roman times, the basics are really the same. Get the road built up on well founded layers and ensure that it is well drained of precipitation and you’ll have a road that will provide great service for longer. The secret to ensuring good drainage on roadways is to ensure that the road is properly served with adequate kerbs and gullies this is most definitely an area wherein KPC excels. 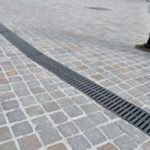 We have an extensive range of kerbs and gullies to suit all levels and types of traffic, from pedestrian-only pathways right up to the heavy duty requirements of motorways. KPC’s road gullies are durable concrete units that are essential components in providing effective drainage from roadways and again, KPC can supply the complete system, including trapped gullies, height-adjusting riser units and cast iron gratings. One of the more heavyweight items from our kerbs and gullies range here at KPC is our Traffic Management Kerb. 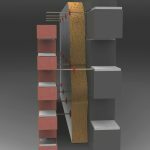 This operates in a similar fashion to our Bus Stop Kerb in that it is designed to be durable as a delimiting kerb deflecting even the tyres of heavy goods vehicles as safely as possible. 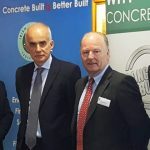 These are very substantial 40Newton concrete components and are particularly useful in ensuring the containment of traffic at busy junctions and traffic islands as well as to protect personnel in booths at toll gates and truck yard entrances. The combination of the bulbous upper profile with the tapered lower profile reduce the risk of extreme jolting when a vehile connects with the kerb and this in turn will reduce the chance of driver injury, vehicle damage and loss of control. Our traffic management kerbs (also called high containment kerbs) are available ex-stock to any post-code in the UK within a few days.